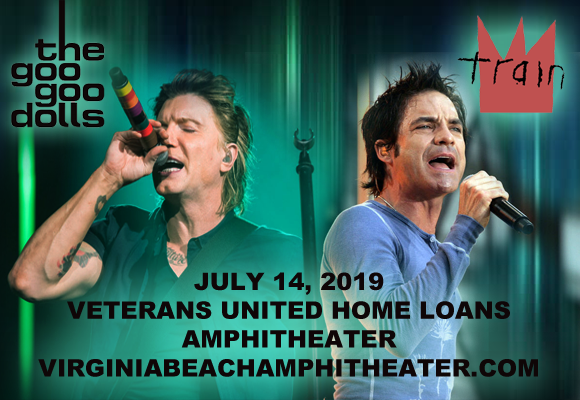 Chart-topping hit-makers Train and the Goo Goo Dolls are bringing a nostalgic co-headlining tour to Veterans United Home Loans Amphitheater on Sunday 14th July 2019! Both bands were prominent sounds on the airwaves throughout the early 2000s and continue to be popular today, so its no surprise that fans are snapping up tickets fast! The two alt-rock groups are known for their lively sell-out shows, and this one will be no different! Best known for their 1998 smash hit single "Iris", from the soundtrack of the blockbuster film City of Angels, American rock band the Goo Goo Dolls first began in 1986 in Buffalo, New York. The group released its self-titled debut album in 1987, finding minor success with the release of their first few punk rock-influenced albums, but it was their pop-oriented fifth studio album, A Boy Name Goo (1995), that brought the band into the mainstream, launching the hit single "Name". Their sixth studio album, Dizzy Up the Girl, achieved triple platinum certification and contained the top ten singles "Slide", "Black Balloon", "Broadway", and "Dizzy", as well as the aforementioned "Iris", which spent nearly twelve straight months on the Billboard charts, holding the number one position on the Hot 100 Airplay chart for eighteen weeks, and topped Billboard's "Top 100 Pop Songs 1992–2012" chart in October 2012. The group's most recent album release was 2016's Boxes.